A small company is a dynamic, creative place where it is necessary for people to take risks to build a new organization. Small business growth is a big business challenge. Leaders of small companies are visionaries and there are strong demands for innovation to do more with less and to bite off grand goals. People who work in small companies work around assumed amount of risk, some even revel in this dynamic environment. However, organizations and leaders may, also, fear growth. When organization culture sets, it is difficult to change. While organizations crave increased revenues, more sales can actually cause an organizations to crumble. Increased revenues increases liability and the risk to deliver on contracts, manage finances, manage vendors, manage customers, and manage employees. Increased sales can cripple an ability to deliver to customers as this can stresses the ad hoc organization culture. Small businesses and high-growth companies that rapidly increase revenues need to prepare for increased accountability, responsibility, and risk. Commitment to innovation and experimentation keeps the organization on the leading edge of new knowledge, products, or services. Processes and hierarchy are a way to mitigate risk, but many times the early employees of small businesses chafe at new processes and they begin to resist organization changes around them. Why is this dangerous? Change is constant and if your organization resists change, you can expect organization sabotage will undo, limit, or cripple your growth and your ability for needed change. The same people who revel in the small company resist the changes that process, procedures, and protocol bring. Their skills and talents might be capable of change, but their motivation may not – this creates organization resistance and drives the low rates of success for organization transformation, mergers and acquisitions, and partnerships. However, as the growth of a firm increases the amount of interactions and the dynamics of each interaction become more important. This is where repeatability and human capital strategies are vital to have in place before growth. Putting process aside for a moment, without a human capital growth strategy the organization leaves chance to decide that the talent that helped prop up the company has the knowledge, skills, and ability to take your company to the next level as well as manage those changes needed for success. Imagine a workforce that can take company from a $1,000,000 in sales to $250,000,000 in sales; different capabilities required and needed for a $250,000,000 company to either compliment or replace those capabilities that can not change. I’ve relied on the competing values framework [below] to identify and assess an organization’s culture. This tool is equally effective human capital strategic planning. In the upper right hand corner, Ad Hoc, you can see the characteristics of smaller company environments. Within the matrix you’ll find an interesting view of how culture competes, resists, or is at odds with another culture. Below, I added a red line between Ad Hoc and Hierarchy. This represents two cultural opposites of organization styles. 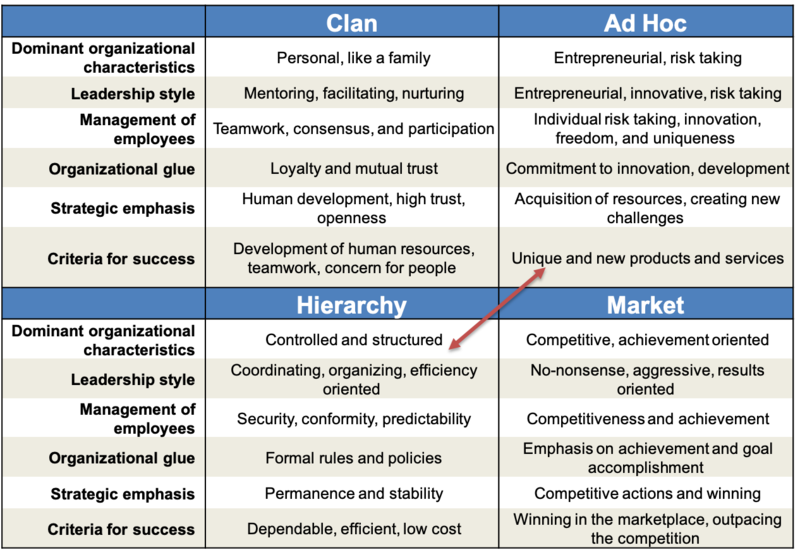 Ad Hoc and Hierarchy represent very different operating environments with very different skill requirements – as well as the working environments. 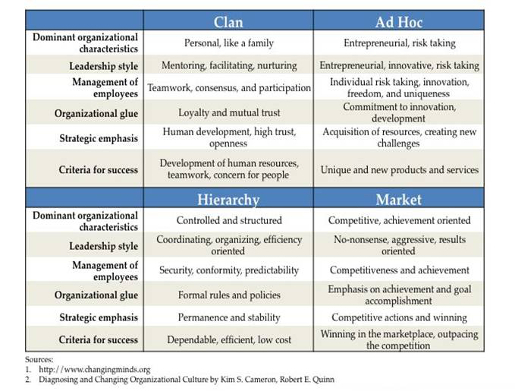 The same opposite culture values are found between Clan and Market cultures. A Competing Values survey identifies individual, team, business unit, and organizational culture styles. A startup’s commitment to innovation and experimentation keeps the organization on the leading edge of knowledge, products, or services, but pushing the boundaries as a daily state of existence may work in a larger company where there is a need for consistency and reliability; from a talent view and a process view. For a company and their talent to grow it is important to identify what to start, what to continue, and what to stop. The cultural snapshot the Competing Values provides gives a view of where your talent is most comfortable operating. Without the Competing Values Framework your culture is left to chance and with a Competing Values assessment your organization can diagram changes needed in skills, competencies, knowledge, and roles. If the Competing Values Framework reveals an overwhelming organization bias in one quadrant you have a gap that to fill to grow and to scale effectively. The assessment gap identifies the skills and abilities you need to either train current staff up to or the skills new hires have to have. Hiring is a small business growth issue when human capital takes upwards of 60% of the big business costs. If the Competing Values Framework reveals a diversity of responses, the more alternative views there are amongst your talent disrupt changes. However there is just as much an opportunity to leverage diverse views in your growth strategy. What do you do, for example, when you identify the need for more talent who have worked with more hierarchy-style experience? How do you blend these professionals into the founding team’s Ad Hoc culture? Identification of new skills and the new needs is how an organization can manage both successful growth and decrease organization resistance. During growth it makes sense to hold on to what worked, incorporate what needs modification, blending the best of both. Change is less daunting when there are elements of familiarity for people to see. The decision of what to start or what to continue is as important as what to stop. This approach not only honors the legacy of what was built, it celebrates the best of what was as a small business growth goal. With some of the above identified you can build competency models and identify the growth needs that now inform your human capital training, your strategic hiring, and your leadership development needs. Your college roommate may have been a great initial director of marketing, but may not have the skills or the desire to take your company to $250,000,000 or to work in an environment necessary to manage the risk to meet this growth target. 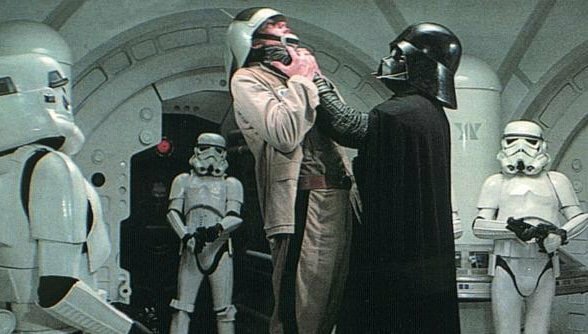 Rather than dealing with his potential resistance a Competing Values Framework identifies to both you and your old roommate his organizational and cultural preference. Now the discussion between the two of you becomes far easier: let’s find a match for his desires and his skills.